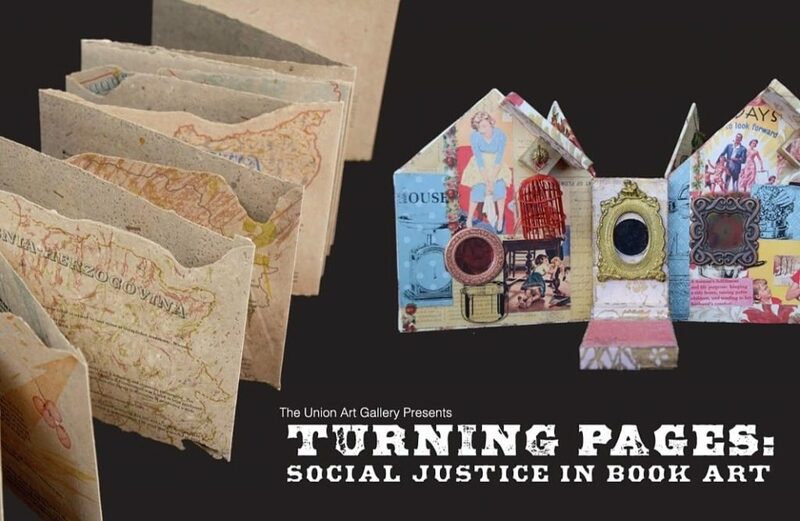 Turning Pages: Social Justice in Book Art encompasses a wide range of artist books and broad sides that aim to raise awareness and motivate individuals to promote social change is our world. Featuring art from the Special Collections at the UWM Libraries, national book artist, John Risseeuw, and projects from Peck School of the Arts Intermediate Print and Narrative Forms class, this show presents a wide array of book art focusing on social justice. We aim to inform people about important social justice topics and allow visitors to express their beliefs on topics they feel strongly about in our temporary maker’s space. Visitors are welcome to create and design a page on a societal topics that we will then bind together collectively at the end of the exhibition! Join us in celebrating book art that advocates on crucial issues and express your own stance on issues important to you! Opening Reception: April 12, 5-8pm, Artist Talk at 7pm! !